Back in February, Atlanta rapper and singer Pollàri debuted his first single "LifeLike", a collab with Lil Yachty, on The FADER. Today, his first EP Sonya has arrived via L.A.'s WEDIDIT collective. D33J and Shlohmo completely produced the project, which finds Pollàri auto-tune crooning over the lush production. 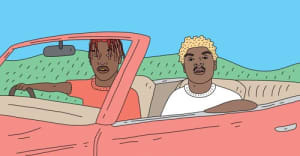 Over eight tracks, Lil Yachty is the only feature, showing up for "Say So" in addition to "LifeLike". Listen below and purchase Sonya on iTunes.